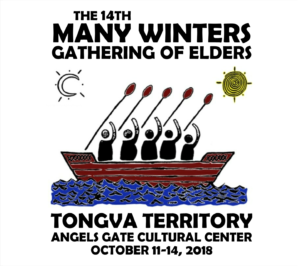 The Many Winters Gathering of Elders Committee announces the forthcoming Many Winters Gathering of Elders at the Angels Gate Cultural Center, 3601 South Gaffey Street, San Pedro, CA 90731, on October 11, 12, 13, & 14, 2018. Located within the traditional Tongva territories, The Many Winters Gathering of Elders Committee will be welcoming and hosting Indigenous elders from local, national, and international communities across Turtle Island. The Many Winters Gathering of Elders community purposes are: to foster a greater understanding of traditional Indigenous knowledge, cultural beliefs, contemporary struggles, and provide culturally educational experiences for all Indigenous and public participants. Over a four-day period, the Many Winters Gathering of Elders will provide the cultural and educational places for people to collectively listen to and learn from an array of important Indigenous dignitaries comprising of elders, community leaders, and cultural educators, share songs, dances, and traditional and contemporary stories. Fully immersed participation by listening and learning about Native American struggles for cultural sustainability, self-determination, and sovereignty for future generations possibilities is part of this year’s 14th Many Winters Gathering of Elders living experiences. With all future relational generations at risk due to the perpetually rapid deterioration, harming, and wounding of Mother Earth, a greater understanding for a collective good mind, “alternative” ways of living, and a process of reciprocal healing requires a basic call to consciousness when responding to all forms of environmental pollution, economic and settler colonial violence. The first Many Winters Gathering of Elders resulted from John Funmaker, Ho-Chunk leader and community activist, vision to help, based on Native American elders’ leadership, provide a community place for connecting, learning, sharing, and healing. In addition, Funmaker’s understanding of the multigenerational colonial violence, leading up to the 500-year celebration of Christopher Columbus’s “discovery” of America, required a gathering place for healing past wounds, historical trauma, and creating healthier future opportunities. The Gathering is free and open to the public. Absolutely NO ALCOHOL, DRUGS, CAMERAS, AUDIO/VIDEO OR OTHER RECORDING EQUIPMENT ALLOWED. For more information, please call (562) 405-5767. The Many Winters Gathering of Elders Committee is comprised of individuals from the Red Earth Defense, Cornelius Projects, and Angels Gate Cultural Center organizations, and the Gathering is sponsored by City of Los Angeles Department of Recreation and Parks.